For all the love and attention we give dogs, much of what they do remains mysterious. Just think about different behaviors you see at a dog park: We have a good understanding of what it means when dogs wag their tails—but what about when they sniff and roll on a stinky spot? Why do they play tug-of-war with one dog, while showing their bellies to another? Why are some dogs shy, while others are bold? What goes on in dogs’ heads and hearts—and how much can we know and understand? Bekoff also considers the practical importance of knowing details about dog behavior. He advocates strongly for positive training—there’s no need to dominate or shame dogs or to make them live in fear—and the detailed information contained in Canine Confidential has a good deal of significance for dog trainers and teachers. He also suggests that trainers should watch and study dogs in various contexts outside of those in which they are dealing with clients, canine and human, with specific needs. There’s nothing in the world as heartwarming as being greeted by your dog at the end of the workday. Read Canine Confidential, and you’ll be on the road to making your shared lives as happy, healthy, and rewarding as they can possibly be. Appendix: So, You Want to Become an Ethologist? "Everyone who owns a dog, breeds or trains dogs, or works with dogs should read this informative book." "A good entree to the big questions of animal behavior." "Bekoff uses an inviting conversational mode that makes complicated topics much easier to grasp. It is as if we had run into him at the local dog park and could ask those questions that pop up as we watch our dogs cavort with others of their species. This rather slim volume covers quite a lot of ground. . . . This informative and accessible book is an invaluable resource that deserves an appreciative audience." "Bekoff shares his own studies and others' research, along with real-life stories, in a winning tone. . . . This book is cause celebre for letting dogs be dogs." "Bekoff turns his considerable skill as an observer and interpreter of canid behavior to providing readers with the investigatory tools and scientific knowledge they need to understand their dog companions more fully and thereby improve the quality of their lives individually and collectively, becoming along the way citizen scientists, in the current parlance. Referring to himself as 'a naturalist in a dog park,' he combines often humorous anecdotes from a lifetime of watching dogs with comprehensible reports from the cutting edge of science. Bekoff, who seems to know everyone who works with dogs, also interviews researchers involved in recent studies in order to underscore important findings or call attention to the direction follow-up studies might take." "The real fascination of this book lies not so much in what dogs do better than us, but in the virtues they have that we always considered to be ours alone." "With the discerning eye of a scientist and the compassionate heart of a dog lover, the incomparable Marc Bekoff illuminates the mysteries of dog behavior. Insights and surprises adorn every page of this wonderful book. But aside from being a great read, Canine Confidential offers deeper value: armed with fresh understanding of your dog’s senses, physiology and mind, you'll find fun ways to make your life together even more meaningful and rewarding for both of you." "Canine Confidential is an incredibly accessible, plain-spoken book about humankind’s most loyal, most faithful companion. The many insights here will help you to earn all that loyalty and love that they so freely give. The stories and observations here will make you a much better human for your canine family members." "One of the world's leading ethologists, Marc Bekoff has devoted his life to understanding non-human animals of all persuasions as sentient beings and to providing them the opportunity to live their lives to their fullest measure, according to their natures, and without being abused or slaughtered by humans. In Canine Confidential, Bekoff turns his considerable powers as an observer of canids wild and domestic to providing readers with the scientific knowledge and investigatory tools that will help them understand their dog companions. Mixing often humorous anecdotes with clear, concise reports from the cutting edge of canine science, Bekoff details what we know and outlines what we have yet to learn about our closest non-human friends. Canine Confidential is a must read for anyone who has an interest in dogs. Even readers who think they know all there is to know about dogs may find themselves looking at and interacting with their companions in ways that enrich their time together." "This is a gem of a book, packed with information that answers the questions you have always pondered, and some that you may not have considered (such as 'Do dogs prefer to lift one leg more than the other?'). Canine Confidential deserves to become a primary resource for dog caretakers and those working professionally with dogs. Marc Bekoff, who is widely respected as a leading authority on ethology and animal emotions, shines the light of his immense experience and research on what makes our best friend tick. If you want to know why dogs do the things they do, this book is for you. Written with eloquence, insight and humor, peppered throughout with anecdotes and photographs, this wonderful book is a must-have for everyone who cares for, loves, studies, and wonders about our canine companions." "Marc Bekoff's vast experience, clear thinking, and unique philosophy come together to make this book a must-read for anyone wanting to know what makes dogs tick. A masterly work by the master." "Another thought provoking, insightful manifesto from one of the most brilliant scientists of our time. 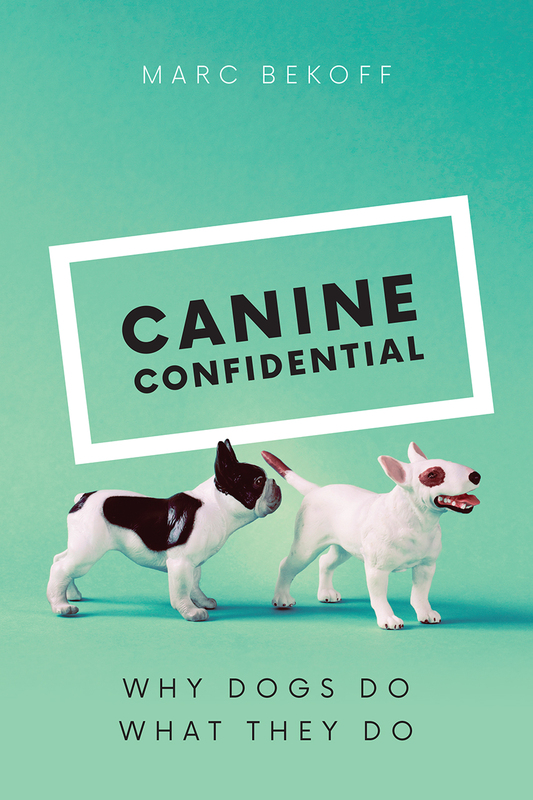 Canine Confidential is a revolutionary perspective into the minds of our best friends, answering the questions everyone asks, as well as the questions no one has thought to ask. Well written, funny, and fascinating--you will never look at dogs the same way again."